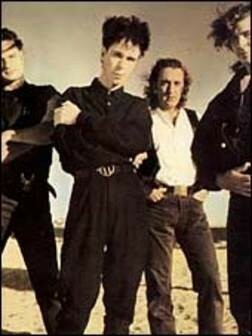 The band originally consisted of David Sterry (lead vocals/guitar), Richard Zatorski (violin/keyboard), Alan Johnson (bass) and Danny Simcic (drums). Steve Williams (keyboard) replaced Zatorski in 1986, who was then replaced by George Pappas in 1996 after a long hiatus of band activity. Real Life released their second and final album with the original lineup in 1985 titled Flame, which spawned minor hits "One Blind Love" and "Face To Face" although neither the album nor the singles repeated their previous success. The first single "No Shame" failed to chart, a video was shot for the second single "Face to Face" and it got airplay in Australia but nothing in the way of success. In 1986, they recorded the controversial song "Babies", which was even less successful, for a new North American release Down Comes the Hammer. "Babies", was the first new recording by the band that was not written by David Sterry and Zatorski. There were two other new songs and a re-mix of "Send Me an Angel". Incredibly this was to be the first of three best of albums after the band had only recorded two studio LPs. Zatorski left the band due to management pressure and attended law school and is now a practising lawyer in Melbourne. At some stage Zatorski formed a new band called Zatorski, and recorded an updated version of "Send Me an Angel". In 1989 Real Life released a new version of "Send me an Angel", titled "Send Me an Angel '89", which fared slightly better than the original in the United States. The video for the 1989 version was identical to the original except Zatorski was edited out of all shots. The Australian video of "Send Me An Angel '89" was shot in Ormond College, The University of Melbourne, with Steve Williams on keyboard. In 1990, they released Lifetime, their first album of all-new material in five years, which spawned minor hits with "God Tonight" and "Kiss The Ground". Steve Williams (keyboard) was the post Zatorski musician and was followed by George Pappas. A falling out occurred between Sterry and the remaining two original members Simcic and Johnson. In 1998, they released Happy, which was followed in 2004 by Imperfection, this time featuring only David Sterry and George Pappas. In November 2005, George announced his departure from the band. David has continued to carry the band name on his own. In 2004 toured the West coast of the U.S. to promote the album Imperfection with additional member Scott Ingram on drums. For this tour the band consisted of David Sterry, George Pappas and Scott Ingram. 2006: 10 versions in remix form on the Send Me an Angel album which has the same cover as the 2004 release Send Me an Angel - Real Life's Greatest Hits, which has two 1989 versions of the song. In spring 2008 Real Life (David Sterry) performed live for the first time in the Philippines along with When in Rome and A Flock of Seagulls as part of the Lost 80's Tour in Manila. Also in 2008, George Pappas released his debut solo album Don't Open Till Doomsday under the artist name of Alien Skin. "Send me an Angel" is often referred to as a Pet Shop Boys song, due to it being mislabeled on a widely downloaded Napster MP3. Many online lyrics websites therefore erroneously credit "Send me an Angel" to the Pet Shop Boys, when it is, of course, by Real Life.